Apple is experimenting with medium- to long-distance wireless charging technologies that could one day allow users to charge up their iPhones with nothing more than a Wi-Fi router, according to a U.S. Patent and Trademark filing made public on Thursday. 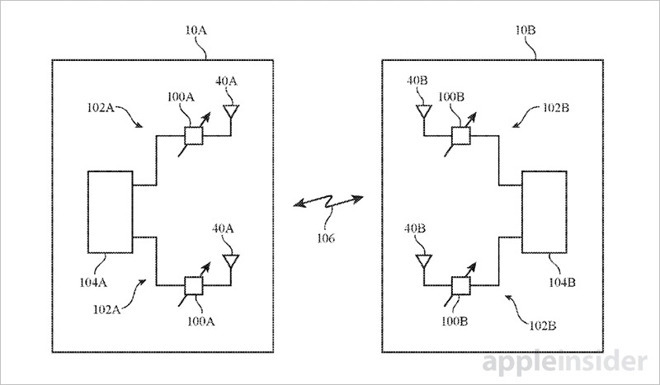 Detailed in Apple's patent application for "Wireless Charging and Communications Systems With Dual-Frequency Patch Antennas" is a method for transferring power to electronic devices over frequencies normally dedicated to data communications. In its various embodiments, the invention notes power transfer capabilities over any suitable wireless communications link, including cellular between 700 MHz and 2700 MHz, and Wi-Fi operating at 2.4 GHz and 5 GHz. More specifically, the document's claims apply to millimeter wave 802.11ad spectrum channels currently in use by the WiGig standard, which operates over the 60 GHz frequency band. Theoretically, the proposal opens the door to wire-free charging from in-home Wi-Fi routers to cellular nodes and even satellite signals. Of course, amplitude in a wireless system is normally a function of distance. Like conventional wireless charging techniques, Apple's design requires two devices —a transmitter and receiver —to function. Each device contains one or more antennas coupled to wireless circuitry capable of making phase and magnitude adjustments to transmitted and received signals. Such hardware can be employed in dynamic beam steering operations. Apple already employs beam steering technology in its —supposedly abandoned —AirPort routers. The most recent models include a beamforming antenna array that directs wireless signals toward a connected device, ensuring strong signals in almost any environment. Apple's invention deviates from contemporary technology in that incorporated wireless circuitry and supporting components handle both communications and power delivery. Current iterations, like Apple Watch's inductive charging hardware, are dedicated to power transfer only, and are limited to very short distances. Apple proposes a variety of techniques to extend that range. Along with dual mode circuitry, the claims recited in today's patent mention dual-polarization, dual-frequency patch antennas consistent with beam forming layouts. Patch antennas typically consist of a flat, rectangular resonating element placed over a larger metal ground plane structure. The flat antenna arrangement is ideal for mounting on flat surfaces, hence the term "patch." The idea of piggy-backing wireless charging on top of existing communications frequencies is not new. Prior research into the field has been promising, with recent studies finding smaller devices can be powered and trickle-charged using only Wi-Fi signals. That technology has yet to find a practical application, however, and companies developing up-and-coming wireless charging systems mostly rely on relatively high-power inductive components that suffer steep drop-offs in transfer efficiency. Unfortunately, Apple's patent application merely covers the theory behind wireless power transmission using existing communications link frequencies, and does not divulge specific operating details beyond the implementation of specialized beam forming patch antennas. The document goes on to describe alternative embodiments, including substitute antenna arrays, wireless circuitry configurations and a host of potential operating frequencies, among other minutiae. Earlier this week, purportedly leaked "iPhone 8" schematics appeared to reveal space for a large wireless charging pad to be positioned in the handset's rear casing. 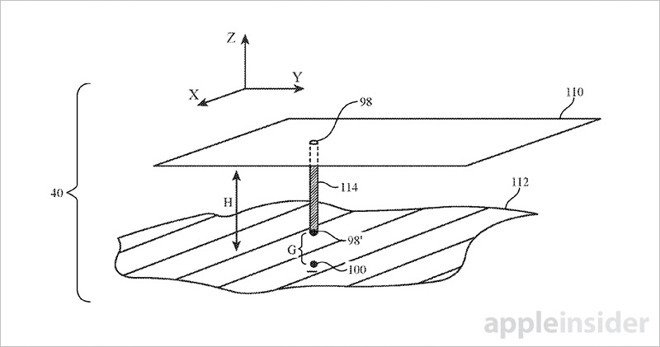 Interestingly, the area resembles a patch antenna similar to applications described in today's patent filing. Apple is expected to introduce some ilk of wireless charging technology in its forthcoming flagship iPhone, though communications frequency-based solutions like the one described in today's invention are not thought to be part of the company's plans for 2017. 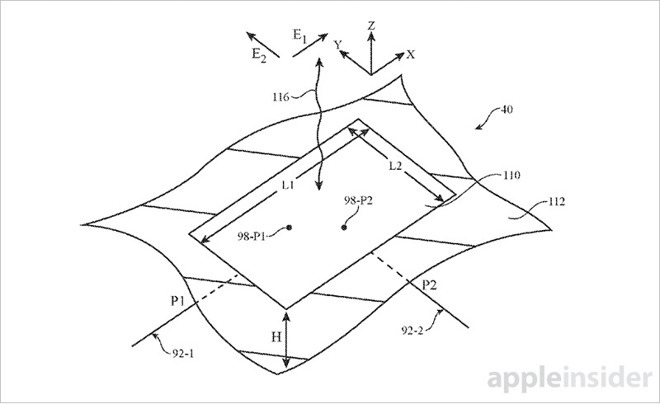 Apple's wireless charging and communications patent application was first filed for in October 2015 and credits Basim H. Noori, Khan M. Salam, Liang Han, Matthew A. Mow, Mattia Pascolini, Ruben Caballero, Thomas E. Biedka, Yi Jiang and Yuehui Ouyang as its inventors.